This clip is a timelapse movie recorded from the O-Town BirdCam on January 5, 2003, from about 8 AM to 5 PM. For the last few winters, we've put up a bird feeder in front of our big picture window and trained a FireWire video camera on it. This camera feeds digital video into an Apple Power Macintosh running a program called EvoCam, which automatically captures the camera image at 10-second intervals and uploads them to our Web server. EvoCam is able to record the images into a single movie clip, and that's what you will see here. In late 2003, this feeder was destroyed by a bear (we think), which bent the steel pole down to the ground and ripped apart the feeder to get at the suet you see in the cage on the front of the feeder. Due to popular demand, we've since replaced the feeder and set the BirdCam up again. Some of the birds you can see in the clip include male and female Cardinals; the Tufted Titmouse; Starlings; male and female Hairy, Downy, and Red-bellied Woodpeckers; the White-breasted Nuthatch; Black-capped Chickadees; Juncos; Bluejays; House Wrens; Crows; and several species of Sparrows. The huge bird you on top of the feeder is a wild Turkey, probably a female. These clips show some hummingbird footage I captured in September 2005 with the Phantom V7.2 high-speed digital imaging camera from Vision Research in Wayne, New Jersey. Rather than using film, the camera continuously captures digital frames at speeds up to nearly 7,000 frames per second to Flash memory. From there, you can download it to a laptop and save it out as a regular digital video clip. I set up the camera on our front deck on a drizzly Sunday afternoon, and pointed it at our feeder. HummerRig.jpg shows the setup - the camera is covered with an umbrella because of the rain. Both clips show what we think is a young male Ruby-throated Hummingbird, probably born the previous Spring - males don't develop the characteristic red throat feathers until their second year. Hummingbird_1000.mov was shot at 1,000 frames per second, and plays back at 30 frames per second, so what you're seeing is 1/33rd of its original speed. This clip is about 1 minute long, so the hummingbird action took place in a little over 2 seconds. 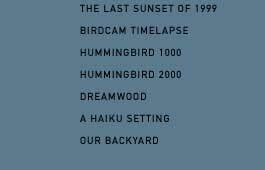 Hummingbird_2000.mov was shot at 2,000 frames per second, and plays back at 30 frames per second, or 1/66th of its original speed. The clip is also about 1 minute long, so what you see here actually took place in about 1 second. You will need to have QuickTime 7 installed and a relatively fast machine to see and hear these MPEG4 video clips. QuickTime for the Mac is available here and for PC here. Dreamwood is a wordless poem of a single line. This film was nominated for Best Soundtrack at the International Festival of Cinema and Technology Film Festival in New York in 2003. A Haiku Setting is an animation of a poem by Joso, a student of the great Japanese poet Basho. This film won Honorable Mention awards for Best Experimental Film and Best Microbudget Film at the International Festival of Cinema and Technology Film Festival in Toronto in 2002. Our Backyard is edited from footage I've shot around our home in the last couple of years. We live next to a land preserve, so we get lots of wildlife.